Mozambique is going nuts about cashews, and they’re boosting the economy’s health. The country’s cashew nut industry, one of the world’s biggest, was dealt a body blow first by the 1977-1992 civil war and then by a controversial World Bank assistance package. Now, the government is looking to help the curved, nutrient-packed nut to recover its past glory. 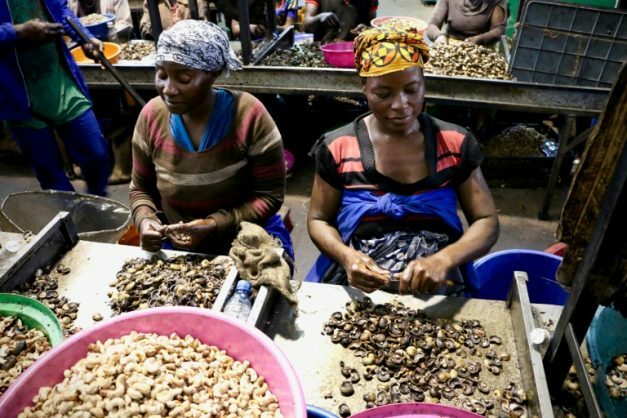 In Nampula, in the country’s north, the end of cashew nut season sees a processing factory burst into activity. Dozens of workers labour under a scorching hot roof, baked by the sweltering heat as they separate nut from shell with a stamp of the foot. Condor Nuts, where they work, is one business that has seized on the support offered by the government having opened a plant in a suburb of Nampula in the heart of cashew country 10 years ago. Condor boss Americo Matos told AFP that he was just getting started. “At the moment, we process 8,000 tonnes of nuts every year,” he said. In Condor’s warehouses, sacks brimming with nuts are piled several feet high. Hundreds of workers — as many as 1,000 at peak times — are on hand to cut, open and peel the harvest, often by hand. For working five or six hour days in noisy conditions, the workers are paid 45 euros ($55) a month, barely more than the minimum wage. “Demand is very strong. We manage to sell everything we produce, the future is bright,” Matos said. Business is also booming for Armendo Joaquim Balanca, whose 140 cashew trees produced two tonnes of nuts last year. Buoyed by his success, he now plans to plant 500 new trees. Since 2010, cashew consumption has surged in Europe, where the nuts have gained in popularity primarily because of their health benefits. Almost three million tonnes are harvested worldwide every year with Ivory Coast’s crop leading the way with an annual production of 725,000 tonnes, followed by India and Vietnam. With output of just 140,000 tonnes every year, Mozambique lags behind the top three producers but is closing the gap — and has big ambitions. “The productivity of the cashew trees is increasing and our plans are, in the near future, to reach the historic level of 200,000 tonnes of nuts a year,” said Prime Minister Carlos Agostinho do Rosario. That symbolic figure was reached in the 1970s — the golden age of cashew farming — but the civil war brought the sector to its knees. When peace returned, the World Bank imposed a neoliberal economic recovery strategy that shook the sector. Experts forced the government to end a tax which had funded development of the industry locally, convinced that the export of raw nuts would be more profitable for producers. The impact was devastating: 10,000 factory jobs were lost while the income of more than a million farmers went into freefall. “The goal of the World Bank was to ensure that the prices were at a level high enough to be sustainable,” said the current head of the World Bank’s Mozambique office Mark Lundell. Cashew nuts are now one of the crops fuelling growth in the agricultural sector. Today, almost half of the raw products are now processed locally. “Without local industry, the producers would not have been unleashed,” said the government’s cashew industry promoter Jaime Chissico. And while competition is fierce with India and Vietnam, Mozambique is holding its own and attracting international investors. Jan Le Grange, the South African owner of 1,300 hectares (3,200 acres) near Namialo to the east of Nampula, initially grew soya. But an overly dry year followed by a season of excessive rain forced him to rethink his plans. “I decided to go for cashew trees,” he said, citing stable global demand and resilient prices. Le Grange just planted 30,000 cashew trees, a number he soon hopes to triple. “It is a good opportunity. I’m very optimistic,” he said.